If we're going on a weekend away with friends, you'd better believe I'm baking something sweet to take along. 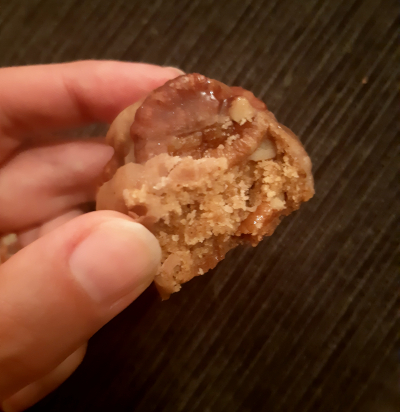 I pulled this recipe for rum-glazed pecan cookies out of Street Vegan - it seemed to strike the right balance between fancy and feasible. That is, after I researched the ingredient 'evaporated cane juice'. It seems that this is some wellness-culture nonsense that is easily substituted one-for-one with regular sugar. With that taken care of, the biscuit dough is an easy oil-based mix with ground flax seeds as an egg substitute. The proportion of pecans to dough is quite high, and since I left my nuts quite chunky, it was challenging to wrap enough dough around them. (I'll try chopping the same quantity of nuts a bit finer next time.) I was pleasantly surprised at how stable the cookies looked after baking and the warm unglazed one I ate straight away was delicious and plenty sweet enough. The glaze, though, is a whole other thing! A huge quantity of icing sugar bound together with little more than dark rum. It complements the pecans, changes the whole profile of the cookies, and keeps their texture softer for longer. Not that that was a serious concern - these easily disappeared within two nights. Preheat an oven to 180°C. Line two baking trays with paper. In a large bowl, beat together the oil, brown sugar, maple syrup, ground flax seeds, vanilla and coconut extract for a couple of minutes. Sift in the flour, bicarb soda and salt, and slowly beat them in to form a dough. Fold in the pecans. Roll tablespoons of the dough into balls and space them out on the baking trays. 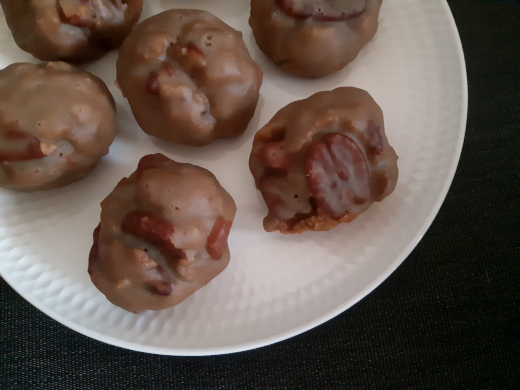 (I left my pecans pretty big and struggled a bit with crumbly dough balls, but they turned out OK!) Bake the cookies for about 14 minutes, until they're browning at the edges. Allow the cookies to cool for 5 minutes on the tray before transferring them to a rack. Sift the icing sugar into a medium bowl. Add the remaining ingredients and whisk them together to form a runny icing. Spoon the icing over the cookies while they're still on the rack, making peace with the wasted glaze that will drip through the rack. Give the cookies at least 20 minutes for the glaze to set before serving or storing the cookies.